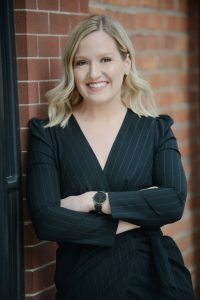 Jessica Stull, general manager of The Pearl in Columbus’ Short North, has more than 13 years of experience in the hospitality industry and has been with Cameron Mitchell Restaurants (CMR) since 2015. Before working at CMR, Stull studied Hospitality Management at The Ohio State University. She began her career in hospitality working as a server and bartender at Colonial Golfer’s Club. She also was a server, bartender and intern at Roosters for a time. Prior to her role at The Pearl, Stull moved her way up from server to supervisor to dining room manager at Hudson 29 Upper Arlington. Stull is incredibly passionate about delivering genuine hospitality to guests, whether it be at The Pearl or in her home with friends and family. Because she has always loved cooking and dining out, being a part of the restaurant industry comes naturally to her. Stull strives to create warm memories for guests through culinary experiences. Her favorite thing about working for CMR is the people. Stull grew up in a small town in Ohio with a strong sense of community and family and has found a similar sense of community working at The Pearl and being part of the CMR family. She’s grateful for an amazing team and is focused on guiding them through encouragement, inspiration and engagement. Stull resides in German Village. When she’s not working, she enjoys cooking, spending time with her nephews, trying new restaurants and traveling. Her favorite CMR dishes are the Shanghai Salmon & Sushi from Hudson 29 and the Steak in a Bowl at M.